Größe der PNG-Vorschau dieser SVG-Datei: 384 × 280 Pixel. Weitere Auflösungen: 320 × 233 Pixel | 640 × 467 Pixel | 800 × 583 Pixel | 1.024 × 747 Pixel | 1.280 × 933 Pixel. or negations. They are shown inside this matrix. These relations are statements, and have negations. They are shown in a separate matrix in the box below. The operations, arranged in the same matrix as above. The 2x2 matrices show the same information like the Venn diagrams. which is marked in red. These 15 relations, except the empty one, are minterms and can be the case. The relations in the files below are disjunctions. The red fields of their 4x4 matrices tell, in which of these cases the relation is true. and there is no element in any black intersection. Negations of the relations in the matrix on the right. In the Venn diagrams the negation exchanges black and red. 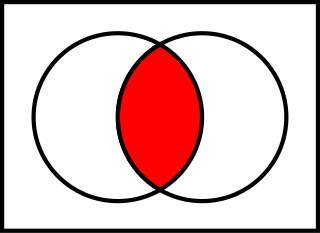 that there is an element in one of the red intersections. (The existential quantifications for the red intersections are combined by or. arranged in the same kind of matrix as above. that there is no element in any black intersection.